Original 8/93; revised 7/94, 12/94, 3/95, 5/95. Converted to HTML, graphics added and minor revisions 11/01. Before doing this tutorial, you must have downloaded and installed MFI. For instructions, please see Installing and Operating MFI. This tutorial will lead you step by step through many of the features of the MFI flow cytometry list mode data analysis program. MFI is most useful when one needs quantitative fluorescence intensity results from single-color, or homogeneous multi-color cell population samples. MFI is also useful for time-kinetic analysis of changes within a single list-mode file (even if your cytometer does not record event time). MFI does not provide quadrant/octant analysis capabilities needed for multi-color work with heterogeneous subpopulations, nor does it allow the placement of arbitrary dividing markers on histograms. However, its automatic peak detection capabilities often suffice for quantitating subpopulations in histograms. This tutorial is divided into three sections, each with its own sample data files. Chapter 1 introduces new users to the basics of MFI in the context of obtaining median intensities for a single-color titration on a uniform cell line. Chapter 2 uses MFI's time kinetic capabilities to display calcium fluxes induced in human T cells. Chapter 3 shows how MFI behaves with heterogeneous human blood leukocytes stained with 3 colors. The data file used for Section 3 is not a type recommended for MFI (since MFI does not do quadrant analysis), but is used here to illustrate some important features of MFI. Quadrant analysis can be done excellently with Joseph Trotter's free PC program WinMDI (from /pub/pc at flosun.salk.edu). Chapter 4 uses MFI's gate ratio capability to quantitate cell aggregation. One of MFI's design principles was to minimize the possibility of inadvertant misinterpretation of data. Below you will see many features that warn you of possible problems with the data. The sample data for this section come from a single-color titration of anti-CD18 monoclonal antibody ascites (CD18) on a human B lymphocyte cell line, JY. Serial dilutions of the antibody were applied to samples of the living cells for 15 min at room temperature. After washing away the unbound antibody, a second antibody, FITC-conjugated goat anti-mouse IgG, was applied for 15 min in the cold to report, as fluorescence, the amount of first antibody bound. After the unbound second antibody was washed away, the cells were resuspended in 1% paraformaldehyde in PBS (5 mM phosphate) adjusted to pH 7.6. It is important that the pH of the final analysis buffer be defined and controlled since the fluorescence of fluorescein increases nearly two-fold between pH 7.0 and 7.6. What we need MFI to extract from the data are the corrected median fluorescence intensities for each sample. As an added bonus, we'll convert the fluorescence intensities to an instrument-independent scale, kilomolecules of equivalent soluble fluorochrome, KMESF. In order to do the latter, one file represents a sample of standard plastic beads from the Flow Cytometry Standards Corp., with a known calibration: each bead emits 212 KMESF. It is critical that the standard beads be suspended in the same paraformaldehyde buffer, at the same pH as the cells, so that the fluorescein on the beads (which is on the bead surface, rather than imbedded in the plastic, for this purpose) is at the same pH as the fluorescein on the surfaces of the cells. We'll refer to file TITRA011 as 'file 11', and so forth. The most common complaint of users is because they have not understood that data files should be separated into logical groups, each in a different subdirectory (folder), in order for MFI to work efficiently. Files acquired for different experiments, with different cells, with different excitation wavelengths, or with different parameters should be separated into different subdirectories. After you run MFI in a given folder, a new file MFI.CFG will appear. Do not delete file MFI.CFG! MFI saves all of your configuration setings in the file MFI.CFG. Each time you run MFI, it looks for this file in the current folder and starts up with the same configuration in effect at the end of the previous session in that folder. By using a different folder for each group of data files, MFI can easily find the configuration specific to that group of files. The sample data files provided with this tutorial are separated into subdirectories as follows. In addition to the files listed below, each subdirectory also contains a Shortcut to Mfi.exe for starting the MFI program. Using Windows Explorer (Start, Programs, Windows Explorer), find the folder (subdirectory) \FLOWCYTM\MFITUTOR\1TITRAT, containing the 8 tutorial data files Titra011-Titra063. If a file named MFI.CFG is present, it is leftover from a previous session and should be deleted. After deleting MFI.CFG (if present), double-click the Shortcut to Mfi.exe to run the MFI program. Depending on your screen resolution, the font size may need adjusting for optimal legibility. See Installation for details. If you have not already registered, a window will open with the title "FREE REGISTRATION REQUIRED BEYOND 50 USES". Read what it says, then press Enter. The next screen you will see is a brown and yellow on entitled INTRODUCTORY HELP. MFI detects that it is being run in this directory for the first time (because it finds no MFI.CFG file left from a previous session), so offers to print its built-in help section 'How to use MFI for the first time with your own data'. The present tutorial is a better place to start, so you can decline MFI's offer by pressing Enter. NOTE: Once you have completed this tutorial, we suggest that you print 'How to use MFI for the first time with your own data' and use it as a guide. If you started MFI correctly (from a shortcut in the 1TITRAT folder), you should see the screen shown at right listing files TITRA011 through TITRA063. If those files are not listed, go back and follow the instructions above for starting MFI from a shortcut in the folder containing these files. MFI is designed to give you results quickly, with minimum keystrokes. Below, you will be shown many of MFI's optional capabilities. First, let's see how quickly and easily you can get results. For now, don't worry about all the details on the screens you'll see -- we'll go through them step by step later. You see a list of the data files, all tagged with triangular marks. Press Enter and you will be asked a question about dot plots. We do not need dot plots for these files, so press 'N' for None. Press Enter, and you will go to the Configuration Overview screen. Press Enter again, and you'll see a screen with a DISCLAIMER and a summary of the default settings, which you don't need to read. Press any key to go to the next screen, and you'll see MFI's tabulated results for the first data file. Focus on the line near the middle of the screen that starts with '100%' (meaning 100% in the gate, since we didn't make a gate yet). You see on that line 276, 305, and 553. These are the median channel numbers for FSC, SSC, and FL1 (cf. the table header line a few lines above, beginning 'In-gate'). Since FL1 was acquired in log mode, its median intensity has been converted to a linear scale in the line 'Linear medians: 145'. Since we didn't make a scatter gate yet, MFI has detected two peaks in FSC and SSC, a small peak (10-5%) of dead cells and debris, and a large peak (90-95%) of single viable cells. It has given us the median channel for each peak. So far, after running the program, we've pressed only 4 keystrokes in order to get all this information. Also available is a more detailed explanation of MFI's primary (text) output. With only 5 keystrokes, MFI gave you quantitative and graphics results. Now we'll take a more detailed look at MFI's capabilities. Run MFI again. This time it knows that you have already been offered the built-in tutorial so it goes straight to the run organization screen. Notice that MFI starts at 'Run 1' (just under the title at the top of the screen). Our first run will be to get the median FL1 intensity for the standard beads. Press 'R' to give Run 1 a name. (Command keystrokes are given in capital letters for emphasis but you need not use the shift key.) You will see a run selection menu. Since the current Run 1 is the one we want to use, simply press Enter to accept Run 1. Now you will notice that the cursor has moved to the run description line near the top of the screen, and the bottom of the screen gives instructions for creating/editing a run description. Type 'Standard beads, 212 KMESF' and press Enter. The cursor returns to file 11, and the bottom of the screen is restored to the main run organization command menu. Notice that all 8 files are tagged with a triangular tag mark. For our first run, we want to examine only file 61. MFI will process only the files we have tagged, so we want to untag all files except 61. Take a minute to look at the command menu at the bottom of the screen. Try pressing the up and down arrow keys to change the highlighted file. (When there are many files, you can also move right and left between columns, and between pages with PgUp/PgDn). Try pressing 'U' and 'T' to untag/tag the highlighted file. Notice that all command keystrokes are bright green. This color cue is used consistently throughout MFI -- the keys you can press at any point are highlighted in green (as in GO). Since we want to tag only one file, the easiest way is to press 'A' (for all files), then 'U' to untag all. Now move the highlight to file 61 and press 'T'. The upper right corner of the bottom section of the screen should now say '1 of 8 files tagged'. Press 'L' (Label). The cursor moves to the #LABEL line, and the bottom of the screen shows label creation/editing instructions. Type 'Beads #3, 212 KMESF' and press Enter. Your screen should now look like the snapshot at right. Optional: Move up to highlight file 61. Notice the line beginning '#LABEL' just below the file list. This line indicates that the keyword '#LABEL' is not in the data file. To see what keywords are in the highlighted file, with file 61 highlighted, press K (see 'Keywords' at the bottom left corner of the command menu). The screens you will now see display the contents of the 'text' block of file 61. The Flow Cytometry Standard (FCS) for list mode data files requires that certain keywords and associated values be present in each list mode data file. Examples are on the fourth line of the first Keywords screen: $CYT (the type of cytometer used), $MODE (L for list mode), and $TOT giving the total number of events acquired. Since the FCS is followed rather loosely, the information in the 'text' blocks of list mode files (keywords and values) will vary considerably for different cytometers and acquisition software. Press space to see additional contents of the 'text' block of file 61. Notice that the last item on the last screen is TOTAL: 5000. Press space to return to the run organization screen. Now we're ready to get the median FL1 for the standard beads. Just below the #LABEL line of the 'Data File Run Organization' screen, in the center, notice 'ENTER/Esc: accept, proceed'. Press Enter. You are now at the Configuration Overview screen. Take a minute to look thru this screen. Notice the options at the bottom (Enter=proceed/ config/save/quit). The default (what happens if you just press Enter) is typically capitalized (although not here). MFI is designed so that most of the time you can just press Enter to proceed. In this case, the default is to proceed with the calculation run. Press Enter. 1.9.1 TABULAR/TEXT RESULTS. The color of the screen changes to indicate that we are now viewing MFI's tabulated results. By default, they appear on the screen, but they can also be sent to the printer or to a disk file. MFI's tabulated output pauses whenever the screen is filled; press any key to get the next screen. Notice the line beginning 'Run 1:' at the top of the second screen of results. At the top of the screen is a block starting 'FACScan: ...' that describes the cytometer, its settings, and the acquisition software. The values in parentheses are the maximum values each parameter can have (channels resolution); the values after the equal sign are the detector and amplifier gains for each parameter. If any of this information changes between data files (e.g. a change in gain or threshold) this block will be repeated; otherwise, it will not. Next comes a line starting 'In-gate' (in red) that contains a table heading for the results. It shows the first four parameters, FSC ... FL2. Since the 5th parameter won't fit on this line, there is a second line labeled 'par 5-8:' for parameters 5-8. The numeric results are given below in columns that line up with this header. The last block on the screen begins 'TITRA061: ...' (in white) and contains the results for the tagged file. No gate was specified yet, so 100% of the events are used for determining the median values 274, 232, 543, 3, 4. Since this was single color FL1 work, the gains were 'off' for FL2 and FL3, and these parameters can be disregarded. The values in parentheses are the Spew* values, namely, the mean/median ratios. A symmetrical peak gives a spew of 1.00. The fact that SSC has a spew of 0.90 indicates a significant asymmetry that should be investigated. In fact, in this case, it is due to the lack of scatter gating. When we apply a scatter gate below, the SSC spew will become 1.0. See also the more detailed explanation of MFI's primary (text) output. 1.9.3 CAUTION FOR OFF-SCALE EVENTS. The line beginning 'FL1 caution: ...' warns us that 18% of the events are off-scale at the low end of FL1. This raises the possibility that the gain may have been too low. In fact, as we will see, these events are probably air bubbles and will be gated out. By default, this caution message appears whenever 10% or more of the events are off scale, either high or low. The trigger value of 10% can be changed if desired. 1.9.4 AUTOMATIC PEAK DETECTION. At the bottom of the screen, MFI informs us that FL1 has two peaks, and gives us the linear intensity for each peak. Notice that 6% of the events have an intensity of 257, almost exactly twice the intensity 131 of 94% of the events. The minor peak is a result of a few percent of the beads being aggregated into pairs. 1.9.5 GRAPHICS: GATE SETTING. Press Enter to view the graphics. Notice the dot plot. It shows, in addition to the major cloud of single beads, a distinct cloud of bead-pairs to the upper right, and probable air bubbles along the bottom. Notice the green 'O for Options' near the middle of the screen. Press O. One of the options on this menu is G to set a gate. All of the options on this menu can be executed directly from the graphics screen by pressing the appropriate key, without first displaying the options menu. Press H to return to the graphics screen, and then press G. Notice that MFI can remember up to 8 gates at once. Press 1, then Enter to select gate 1. First you are asked to indicate the parameters to be used for gating. MFI expects that the first two parameters in the file will be FSC and SSC, and that you probably want to use these for gating. Press Enter 3 times to accept the defaults: X=FSC, Y=SSC, and Z=blank. Now you are asked to describe the gate. Type 'Beads', and press Enter. MFI now recalculates the results for data file 61, using the gate. After a few moments, a new tabular results block is shown. Notice that the percentage of events used for calculating the medians has dropped from 100% to around 70% that are inside the gate. Notice that the descriptions of multiple peaks that were there before gating have disappeared, meaning that all gated parameters have single peaks. 1.9.6 EVENT CLOUD DRIFT. After the percent of events in-gate are two new numbers, R/T (Right/Total) and H/T (High/Total). These show the fraction of the in-gate events that are in the right half and the top half of the gate, respectively. Values close to 0.50 indicate that the gate is centered around the event cloud. Significant changes in these two values between data files indicates a drift of the event cloud relative to the gate boundaries, and may indicate a need to widen or adjust the gate. 1.9.7 KMESF. As a result of gating, the spew value (Sp) for SSC has gone from 0.90 to close to 1.00. Notice the linear median for FL1, about 135, up slightly from 132 due to gating. Since we want to express our FL1 intensities as KMESF, and since the beads have 212 KMESF, we must multiply our linear medians by 212/135 = 1.57. The determination of this KMESF correction factor must be done by hand; write down the result '1.57' for use below. 1.9.8 GATED GRAPHICS. Press Enter to return to graphics. The rectangle for gate #1 is drawn on the dot plot, and the gated histograms are unimodal and much more symmetrical. MFI can display up to 6 histograms at once. In this case, the last two of the five shown are immaterial since this is a one-color experiment. Press O to review the options menu, and notice the C option to return to the Configuration menu. Press C, read the note and press Enter to go to the Configuration Menu. Press S for Screen to see MFI's master help menu. From here you have access to nearly all of MFI's help. A great deal of information not covered in this tutorial is available in the help system. After you have explored anything that may interest you at the moment, press Esc to return to the Configuration Menu. 1.11.1 SECOND RUN. Press 2 to return to the run organization screen. Notice that 'Run 1: ...' still shows at the top. On the command summary just below ENTER, notice 'Runs/+/-'. Press +; the line near the top changes to an unnamed 'Run 2:'. Initially, no files are tagged for Run 2. Press R and give Run 2 the name 'Titration of TS1/18 on JY'. Run 2 Organization, after completion of 1.11.5. All samples are labeled (and labels displayed with A, L), 62-63 are moved to the top, gate 2 is assigned to sample 62 (but not yet defined), and 63 is marked as the Control to be subtracted from subsequent samples, and for having its Histogram overlayed on subsequent samples. Sample 61, being untagged (triangles at left) is not included in Run 2. Now label file 11. Press A, L to show Labels for All files. Pressing A, L again will toggle back to showing filenames only. Use either display as you wish. Now, with file 11 labeled and highlighted, press @ to invoke the label ditto capablity. Move the highlight to file 12, press L, and then press Shift-double-quote (the ditto mark) to copy the label for file 11 into the slot for file 12. Change the 1/300 to 1/900. In this way you can label files 12-15 with minimal typing. Press P to toggle the command menu or Prompts off. This allows the full screen to be used for the run organization list, and is useful when there are a large number of files. If you forget the keystroke for a command, you can always press P to see the Prompts again. Leave the prompts showing since we have a small number of files. 1.11.3 BLOCK MOVE. Run 2 should start with autofluorescence file 62, proceed to 2nd Ab only file 63, then continue with the 1st Ab dilutions in files 11-15. It is crucial to process file 63 before files 11-15 so that the FL1 intensity in control file 63 can be subtracted from the the FL1's for 11-15. Place the highlight on file 62, and press M to initiate a block move. Follow the instructions for moving the block 62-63 to the top of the list (press the 'Home' key to highlight the destination). The order should now be 62, 63, 11-15, 61. 1.11.4 GATE ASSIGNMENT. Notice the '1' that has appeared next to file 61 as a result of our earlier gate-setting; this indicates that gate 1 will be applied beginning at this file. The '0' next to file 11 means that it will be processed ungated. The double quote ditto marks indicate that the previous gate will be applied. Press G to see a list of the gate names, then Esc back to the run organization screen. We know that we'll want to scatter-gate the JY cells, so with the highlight on file 62, press 2 to assign gate 2 to it. Change the 0 next to file 11 to a ditto mark, and tag files 62, 63, 11-15 (but not 61) so gate 2 will apply to the entire run. 1.11.5 CONTROL. Place the highlight on file 63 and press C to mark it as the control file for the run. Accept the offer to mark it with 'H' to make its histograms overlay onto those of subsequent files in the run. Your run organization should now look like the figure above right. 1.11.6 SAVING THE CONFIGURATION. MFI saves its configuration in a disk file, MFI.CFG. However, none of the changes we have just made to this screen have been saved to the MFI.CFG disk file yet. Should we inadvertantly quit to DOS prematurely (or should the electrical power fail), all these changes would be lost. Notice that one of the options (tucked in between Runs and Control) is to Save the configuration. Press 'S' to save it. The configuration is saved automatically whenever you proceed with the calculations of a run, but when you do a lot of configuring, it is a good idea to save it periodically until you are ready to calculate. Press Enter to return to the configuration menu. Press '3' to select Parameters. We do not need results for FL2 and FL3. Press '5' to select the 5th parameter (currently FL3), then press Space, Enter to enter a blank parameter name. FL3 should disappear, leaving only 4 parameters. Similarly blank out FL2. Now press '3' to select FL1. Press Enter to preserve FL1 as the parameter name. Now it is time to Enter the 1.57 KMESF factor we calculated above. The Parameter menu should now look like the screenshot at right. Press Enter to return to the Configuration Menu; Enter again to proceed to the Configuration Overview. Notice how the run organization we've set up is summarized here. Now press Enter to proceed with the run. The text results for file 62 will be displayed. Notice how the linear median of 3.31 has been multiplied by 1.57 to give a final autofluorescence intensity of 5.19 KMESF. Because gate 2 has not yet been defined, the file was processed ungated, and multiple peaks are detected in FSC and SSC. At the bottom of the screen you are informed that the time has arrived to set gate 2. Press Enter, accept the defaults for X, Y, and Z, name this gate 'JY Cells', and proceed to set a gate around the major event cloud. JY cells tend to aggregate, and aggregates tend to have high SSC. To restrict the gate to single cells, set the top of the gate not higher than channel 400 (you can tell where the top is by looking at the SSC channel numeric range given at the top right of the screen). The tabular results after gating will show roughly 60% of the cells in the gate. The FL1 intensity is now <5.0 (due to exclusion of aggregates), and multiple peaks are no longer detected. 1.13.1 GRAPHICS. Press Enter to see the graphics. The 3rd histogram is expanded to fill the space available when only 3 are needed. The peaks are relatively symmetrical. 1.13.2 GATE DISPLAY CONTROL. Both gates are shown: the current gate (solid), and the bead gate (dotted). Since the bead gate is irrelevant to the cells, let's get rid of it. Press 'O' for options, then 'R' for rectangular gates to show. 'All gates' is the current setting; press 'C' for current gate only, and accept the default to show gate numbers. Now press 'H' to view the Histogram/dot plot screen again. 1.13.3 NEXT FILE. Press Enter to proceed to the next file, 2nd Ab only. Are any of the values significantly different from the previous file? To be sure, press 'B' to backup. The results of file 62 are tabulated again. Now, press 'N' for Next file, and file 63 is recalculated. There are no significant differences. Thus, there is no unwanted binding of the FITC-conjugated 2nd Ab. Because we marked file 63 with a 'C' for control, it has been subtracted from its own KMESF value, giving a result of 0.00. Press Enter to see the graphics, which are similar to those for file 62. Graphics for file 11, with histograms from control file 63 overlayed as dotted lines. Solid histogram lines represent the current file 11. Median intensity for file 11 (vertical white line in LOG FL1 histogram) has been converted to a linear scale and units of KMESF. The text display (press T) shows that after subtraction of the control intensity from file 63, the corrected median fluorescence intensity for file 11 is 197 KMESF. Press Enter to proceed to file 11. A slightly lower percentage of the cells are in the gate, likely due to antibody-induced aggregation. The corrected FL1 KMESF is about 200, giving a signal to noise ratio of about 40. Press Enter to see the graphics. The control histograms are shown as a dotted line overlayed onto the histograms for the current data file. The median-indicating vertical line is drawn only for the current data file histograms. Press Enter repeatedly to view the results for the remainder of the files in this run. After the last file, a summary of the highest and lowest values in the run appears. This makes it easy (which is important in longer runs) to check whether any percentages in-gate, R/T, H/T, or spew values were abberrant. Here, the ranges for these values are small, showing that for the series of samples in Run 2, the event cloud did not drift out of the gate, and that all peaks were symmetrical [spew (Sp) remained always near 1]. Another keystroke announces 'RUN COMPLETED'. Press Enter to return to the run organization screen. Press Enter to go to the Configuration Overview, and 'C' to go to the Configuration Menu. At the bottom are some shortcut keys. Press 'P' to direct output to the printer, and 'G' to toggle off graphics. Press Enter back to the Configuration Overview, Enter to proceed with the calculations. This time, the tabulated results will be printed. Quit from MFI to DOS. From the table of printed results, you can read the corrected intensities for the titration, which will be approximately 201, 186, 140, 79, 34 KMESF. These results fit well the one-site binding form of the Michaelis-Menten equation I = Imax (C/(C + Ch)), where I is fluorescence Intensity, C is Concentration of antibody, Imax is the intensity at saturation, and Ch is the concentration giving half-saturation. The antibody dilutions (300 ...24,300) must be expressed as a concentration, such as v/v percent: 0.33, 0.11, 0.037, 0.012, 0.0041%. Inspection shows that Ch must be where I is approximately 100, which is between 0.037 and 0.012%. If you use a scientific plotting and equation-fitting program, you will find that best fit to the equation is when Imax is 220, and Ch 0.021% (1/4,800). The equation predicts that at 4Ch (1/1,200) 80% of saturation will occur, at 9Ch (1/530), 90%, and at 19Ch (1/250), 95%. If you are still running MFI, Quit it. Using Windows Explorer (Start, Programs, Windows Explorer), find the folder (subdirectory) \FLOWCYTM\MFITUTOR\2KINETIC, containing data files A23187.CAL, OKT3.CAL, and OKT3EGTA.CAL. If a file named MFI.CFG is present, it is leftover from a previous session and should be deleted. After deleting MFI.CFG, double-click the Shortcut to Mfi.exe to run the MFI program. Proceed into MFI until you see the 3 files on the run organization screen. You'll notice that these files have already been labeled. MFI is using the configuration in the file MFI.CFG that we just made. The calcium activity is reported by the ratio of fluorescence at two wavelengths. In these files, the cytometer calculated this ratio and saved it as parameter FL4-R. A high threshold was used and scatter gating is not necessary. At the run organization screen, press Enter; when asked about dot plots, respond with 'K' for kinetic dot plots only. At the configuration overview screen, notice the line beginning 'GRAPHICS'. The abbreviation H123 means that the Histogram screen will be shown first, followed by dot plot screens 1, 2, and 3. '128 chan/hist' means that histograms will have 128 channels. '1 screen of 2500-event dotplots' means that only one screen of dotplots has been defined; therefore, there are no screens 2 and 3 to display. Press Enter to proceed to calculations, and Enter to see graphics. Notice how the TIME axis is labeled "203 seconds"; this is the duration of the interval during which data were collected. The TIME histogram falls off at the end. This means that fewer events/second were acquired during the last third of acquistion time, possibly due to dilution of the sample and/or sedimentation away from the sample intake opening (these samples were not continuously stirred). The dot plot below the histograms has two clusters of dots, low calcium and high calcium. Notice that the dots are yellow. MFI uses yellow dots for non-kinetic dot plots, such as ordinary scatter plots, or the scatter vs. ratio plot shown here..
You are now viewing the H screen of the H123 sequence. Press Enter to proceed to dotplot screen #1, the next in the default sequence. Notice that these dots are purple, the color used by MFI for kinetic dot plots. The plot on the right shows a sharp increase in calcium (FL4-R) upon the addition of A23187, and a sharp return to baseline upon the addition of manganese. This control defines the minimum and maximum signals for the experiment. Notice that 100% of the cells responded to the A23187 (no dots remain low during the mid-portion of the plot). In contrast, forward scatter (left dot plot) was unaffected by the reagents added, so was constant with time. The white line drawn over the purple dots shows the median value of the ordinate (Y) parameter for each of 32 time points. The configuration menu allows you to display dots alone, the line alone, or both in any single panel. Notice the red 'GAPS' message at the upper left of each plot. This refers to the fact that there were too-few dots at the very end of the time scale to calculate a reliable median, hence there is a gap in the white line here. Pressing F2 displays help on this subject; it returns you to the graphics options menu, where you press 'D' to return to the kinetic dotplots. 2.4.1 FRACTION OF CELLS RESPONDING. Press Enter to proceed to the next file. Take a look at the histogram screen, and then press Enter to go to the kinetic dot plot screen. The white line shows a nice transient peak. Not all the cells responded, but the majority did, else the median line would remain flat. We'll determine the percentage of cells that responded by using a gate to limit the FL4-R histogram to the period of time with a high response. First, press 'H' to return to the histogram screen, and notice the shape of the ungated FL4-R histogram. Now, press 'G' to set a Gate. Press '1', Enter to use the first slot. The X parameter should be TIME. MFI provides parameter-name completion. This means you need only type 't' and press enter to specify TIME. The second parameter defaults to FL4-R, which is what we want, so simply press Enter. We do not want a Z parameter in this gate, so press Enter to leave Z blank. At the gate description screen, type 'Peak response (OKT3)', then Enter. We want to make large movements of the rectangle boundaries, so press PgUp to increase the increment to 25 channels. Use the arrow keys to move the rectangle until TIME starts at channel 379, and FL4-R ends at channel 659 (or close to these values). Now press the END key, and move the lower right corner until TIME ends at about channel 509, and FL4-R begins at about channel 29. This rectangle encloses only the time during which the peak response was observed. Press Enter; Enter again to apply this gate to the Current file; Enter to see the graphics. Examine the FL4-R histogram. Press 'M' to magnify it, then select '2' for the FL4-R histogram. MFI's automatic peak resolution informs us that 70% of the cells responded, with a median intensity of channel 368. The vertical white lines are the median values, and the broken red line is the low point or valley between the peaks. 2.4.2 REARRANGING HISTOGRAMS. Press Enter to unmagnify. Since we're more interested in the FL4-R histogram than the time histogram, lets swap their positions. Press 'C' for configuration. At the configuration menu, select 'Parameters'. Select parameter 2, type 't' for TIME, and press Enter twice. Similarly, change parameter 3 to 'FL4-R'. Enter to return to the configuration menu, and select 'Run organization'. Press 'U' to untag A23187.CAL since we don't need to see it again. Enter repeatedly until you see the histogram screen, and notice how the FL4-R histogram is now larger. 2.4.3 RESPONSE DURATION. Press 'G' again to define a new gate. Use slot 2, TIME vs. FL4-R as before, and call it "Response duration (OKT3)". We'll place the time boundaries at approximately the half-maximum rise and fall points. Set the top of the gate at FL4-R = about channel 534, and the left edge at TIME = about channel 304. Place the bottom at FL4-R = about channel 129, and the right edge at TIME = about channel 659. This tells us that the response duration was 659 - 304 = 355 channels. Press Enter to apply the new gate to the file, and examine the tabular text output. Notice the line 'Graphic time expanded to full scale: 5.01 channels/second'. Thus, 355 channels is 71 seconds -- this is the duration of the response. The same methods may be applied to the next file, creating gates 3 and 4. In the presence of EGTA, about 37% of the cells responded to a median level of 256, with a duration of 289 channels or 58 sec. Display a graphics screen that you like and try printing it. Press 'P'. If you have not already selected your printer, select 'Y' to change the printer. You may have to experiment a bit until you find good settings for your printer. The line drawn by MFI on a kinetic dot plot provides only a quick, rough visualization of the kinetic changes. It is based only on the in-gate portion of the dots requested per plot (2,500 by default). Hence, it is based on only a small portion of the data in the file. You can use MFI's file-slicing ability to generate medians based on the full data set. From one of the kinetics graphics screens, press 'T' to review the tabular/text output from this file. Note that data were acquired for 204 seconds. Return to the configuration menu (e.g. from a graphics screen, press 'C'). Check the run organization. Let's untag all files except OKT3.CAL, and process it ungated, so be sure the filename is preceded by '0' (no gate). Enter to return to the configuration menu, and select 'File slicing for kinetic analysis'. Let's make 32 slices of the file (the same number used for MFI's automatic median line). 204 seconds/32 slices is about 6.3 seconds/slice. Enter 6.3 in the 'seconds per slice' position. (Note that if our file did not include TIME as a parameter, we could define slices based on the total events in the file, 53,900. Dividing this by 32 gives 1684 events/slice.) WARNING: WHEN SLICING, MFI MAKES EQUAL EVENTS PER SLICE; IT IGNORES THE ACTUAL TIME RECORDED WITH EACH EVENT (if any). Press Enter repeatedly, processing the file. Reply 'Y' to the question 'Do you really want 32 slices per file?'. (If you had more than one file tagged this would generate a great deal of output!) You are now shown the tabular results for the first slice: median FL4-R is 77 at 3.15 sec. View the graphics if you wish. Proceed from slice to slice (use 'N' for Next slice), noticing the median FL4-R value climb sharply in slice 10. In slices 11 and 12, MFI reports 2 peaks in FL4-R; these peaks look real. However, in slice 13, 4 peaks are reported -- these are probably just noise. On histograms, MFI overlays the first and most recent previous slices onto the current slice. By default, MFI keeps all overlays on the same scale, so that the areas are proportional to numbers of events. To get a better look at the current slice, press 'S' for scale. Answer 'Y' to scale each histogram independently, and press Enter twice to default the next two questions. Back at the histogram screen, press 'M' to Magnify histogram number 3, FL4-R. Now you can see that the "four peaks" are not real; there is too much noise in the histogram. It is not necessary to do this now, but if we wished, the configuration menu allows us to reduce the sensitivity of peak detection or to turn it off entirely. Continue pressing 'N' repeatedly for each Next slice. FL4-R peaks in slice 16 at 316, and levels off near 100 in the last few slices. When asked whether to Quit to DOS, press 'Q'. At the configuration menu, one could turn off graphics and direct the tabular output to the printer. The slice results would then be printed, and from this printout one could enter the data into a scientific plotting program to produce a publication-quality graph. Slices can also be exported by MFI as ASCII histogram or listmode data. All the configuration choices you have made during this kinetics tutorial have been saved in the local file MFI.CFG. We'll now use a different configuration for MFI that illustrates additional features. MFI's configuration menus were used to set up a custom graphics sequence, and the resulting file MFI.CFG was renamed to KINETICS.CFG and distributed with this tutorial. In Windows Explorer, rename mfi.cfg (the configuration you just created) to my.cfg (a name ignored by MFI). Then copy the file kinetics.cfg and rename the copy to mfi.cfg. If there is already a file named My.cfg, it is left over from a previous session -- delete it. Right click on Mfi.cfg and select Rename. Change the name to My.cfg and press Enter. Right click on Kinetics.cfg and select Copy. Move your mouse to a blank white area in the 2Kinetic folder, right click, and select Paste. A new file should appear named "Copy of KINETICS.CFG". Right click on "Copy of KINETICS.CFG" and select Rename. Enter the name "MFI.CFG" (without the quotes). Double click the Shortcut to Mfi.exe to run the MFI program. MFI will read MFI.CFG and obey the configuration specified therein. Proceed to the configuration overview. Notice that after GRAPHICS, instead of the default sequence 'H123', there is '12'. This means that for each file, the first graphics screen shown will be dot plot screen #1, followed by dot plot screen #2. By default, the histogram screen will not be shown. However, it may be shown by calling it up directly, as we shall see below. Press Enter to process the A23187 file, and Enter again to see the first graphics screen. Since more than 4 graphs were configured, the screen is divided into 9 panels (a maximum of 9 panels can be displayed per screen). The left and middle columns show the now-familiar ionophore->quench kinetics in all three modes: dots only, dots with line, and line only. Try magnifying panel 7 ('M', '7', when finished viewing, 'space'). Any graphics screen, including magnified screens, can be printed when desired. The upper right panel shows the event rate. The fall-off in rate upon the addition of quencher can be seen clearly. Press enter to see dot plot screen #2. The kinetics capabilities of MFI are also available even when TIME is not recorded as an event listmode parameter. MFI can plot any parameter vs. event number, as seen in the lower row on this screen. Since the event rate may vary with time, if event times are unknown, the X axis will not be colinear with time. Notice how the drop in FL4-R upon quenching appears delayed in the lower row, as compared with the upper. When plotting FL4-R against event number (instead of time), the fall off in rate towards the end of the file has no effect: events are plotted according to their sequence in the file, not according to the time when they passed the laser. Thus, although some details of kinetics may be lacking when time cannot be recorded as an event parameter, changes in fluorescence vs. time are nevertheless clearly seen vs. event number. Press Enter. You will proceed to the next file without viewing histograms since the default sequence is set to '12'. Press Enter to see dot plot screen #1. Press 'O' for options. Notice that the default graphics sequence is displayed at the bottom of the right hand column. At the upper left is shown the results of pressing Enter (or Space), namely, you will see dot plot screen #2. However, you may jump to any graphics screen that is defined, regardless of the default sequence. Press 'H' to see the histograms. All keystrokes on the Graphics Options screen can be executed directly from a graphics screen without first displaying the options list. For example, press '2' while the histograms are displayed; you will jump directly to dot plot screen #2. Let's take a more detailed look at some graphics configuration options. Press 'C' to return to the configuration menu. Select 'Graphics output options'. Notice that here is where the default graphics screen sequence can be customized. Select 'Dot plot options'. The 'Fast setup' option is what MFI uses for a new set of files, but is not usually needed thereafter. Select 'Custom dot plot layout'. Here you see the details of the layout of screen #1, and from here you can make any changes desired. Press 'L' to see a different view of the layout that may be helpful when composing dot plot screens. When finished examining this, press any key to return to the Customizing menu. Press '+' to move to screen 2. We'll add a dot plot just to see how this works. Press '8' to change that position. Press Enter to accept the default, Edit. Type 'FS' and press enter to set X to FSC-H. Type 'FL' and press Enter to set Y to FL4-R. Press Enter twice to accept the next two defaults. The information should now appear on line 8. Press '9', then 'S' for Swap, then '8'. The new panel should move to position 9. Press 'L' for Layout and notice the new panel at the lower right of screen #2. Press Enter repeatedly (8 times!) until you see dot plot screen #2 with the new panel. Press 'Q' to quit to DOS. You have now completed the kinetics tutorial. However, there are some nifty features of MFI you haven't tried yet. The following section will introduce you to most of these. Using Windows Explorer (Start, Programs, Windows Explorer), find the folder (subdirectory) \FLOWCYTM\MFITUTOR\3COLORS, containing data file 3COLORS.PBL. If a file named MFI.CFG is present, it is leftover from a previous session and should be deleted. Double-click the Shortcut to Mfi.exe to run the MFI program. The 3COLORS.PBL file, acquired on a prototype Coulter XL analyzer, was provided through the courtesy of Geoffrey W. Osborne of the John Curtin School of Medical Research, Australian National University, Canberra. Proceed to the run organization screen. Notice that the file has already been labeled. Press Enter and then 'C' for 2-Color dot plots only. Several more Enters get you to the tabular text results for this file. You will notice an impressive number of peaks. Press Enter to see the graphics. FS shows two peaks corresponding to lymphocytes and non-lymphocytes. The valleys between peaks are marked with a broken red line, and the median for each peak with a solid white line. MFI has a configuration option to display the the mean as well. The median is a more reliable estimate of the center of a peak than the mean (see Appendix II); hence, it is provided by default in MFI. SS shows 3 peaks corresponding to lymphocytes, monocytes, and granulocytes. Notice, however, that MFI's automatic peak detection has failed to detect the middle peak. MFI's peak detection can however be increased in sensitivity. In FL1, we see that 6% of the leukocytes are positive for CD8. FL2 and FL3 look peculiar. To see FL2 better, press 'M' to magnify, then '4' to see the FL2 histogram. There are three small peaks along the bottom. The reason they are so small is that there are a large number of off-scale events piled up at the left. The Y axis has been scaled to include the full height of the end-pileup, which forces the 3 peaks to be very short. Notice how the vertical median line for the first of the 3 peaks is way off to the left. This means that there a large number of off-scale events. Let's find out how many events are down there. Press any key to return to the histogram display, then 'O' for options. Now, press 'T' to review the tabular/text output. Here you can see an "FL2: caution" message that 36% of the FL2 events are in channel 0! (This file was acquired on a prototype Coulter Epics XL analyzer. What this off-scale pileup represents is not clear. It may be related to the digital log conversion used by this instrument.) Press any key to return to the graphics options menu, and select 'H' again. Notice that MFI does not draw a Y axis line in order that end-pileups be obvious. From the histogram screen, press 'S' for Scale. Select 'Y' to clip the ends, then select 'Y' again to see the end values. Notice that FL2 has 6914 events in channel 0, 10 events in channel 1, etc. The last FL2 channel that contains any events is channel 969, containing 2 events. Press a key to return to the graphics screen. Because the first and last occupied channels are now ignored when determining the Y scale, the peaks are now much more visible. Notice that 6% of the leukocytes are strongly positive for CD8 (FL1), 14% for CD4 (FL2), and 21% for CD3 (FL3); and that 6 + 14 equals 20%, consistent with the expectation that all CD8 and CD4 cells also express CD3. 3.5.1 GRANULOCYTES. Press Enter back to the Configuration Menu and select Peak Detection. Set 'automatic peak detection' to NO (the valley lines will clutter up our histograms too much). Now press Enter and select "Graphics output options", Histogram options, and set 'Draw lines at medians' to NO. Press Enter repeatedly until you are at the GATE NUMBER screen, at which point you are ready to set the first gate. Enter to accept the default gate parameters FS and SS (Z left blank). At the GATE #1: DESCRIPTION screen, type the word 'Granulocytes' (before "[FS vs. SS]"), and Enter this as the gate description (name). At the gate graphics screen (white rectangle on dot-plot), position the rectangle around the topmost cloud on the dot plot. Enter to apply the gate and view the graphics. Pressing Enter at the histogram screen brings up the 2-color dot plot screen we requested. It is not very interesting, showing only that granulocytes were not stained by any of these reagents. 3.5.3 LYMPHOCYTES. Press Enter until you are asked to set gate 3. Name it 'Lymphocytes', and position it around the lower cloud of events. In order to make the rectangle small enough, you will need to press 'End' and reduce the height of the rectangle, then press 'Home' and move it down onto the lymphocyte cloud. Press Enter until you see the graphics. By default, all 3 overlayed histograms are put on a single, common Y scale. This makes the areas under the peaks proportional to the number of cells in the peak. Alternatively, overlayed histograms can be scaled independently. Press 'S' for Scaling. Because overlays are present, a new option appears. Press 'Y' to scale independently, and then Enter twice to return to the graphics screen. Now you can see the peaks from each gate clearly, because each of the 3 overlayed histograms in each panel is raised to the full height of the Y axis. Press Enter to proceed to the dot plot screen. In the upper right panel (FL1 vs. FL3) you see in the upper left cloud the CD4+ T cells; in the upper right the CD4- (mostly CD8+) T cells; and in the lower left, the CD3- cells (mostly B cells).MFI does not provide quadrant analysis. 3.8.2 SMOOTHING BY CHANNEL POOLING. An alternative method of smoothing is to pool the events in adjacent channels into smaller numbers of channels. By default, MFI uses 128 channels. Select Configuration, Graphics, Histograms. Change smoothing cycles from 1 to 0, and channels from 128 to 32. Now press Enter repeatedly (pressing Next file to skip graphics for granulocytes and monocytes), arriving back at the triple overlayed histogram screen. You'll see that this rudimentary method of smoothing produces quite nice results, although rather sharp-tipped peaks. With the histogram screen showing, press 'P' to print it. Select 'Y' to change the printer selection. You may have to experiment a bit until you find good settings for your printer. MFI can report the ratio of events in two gates. This is simply a convenience, since one could calculate the same values manually using the percentage in-gate reported by MFI for each gate. However, the manual method requires printing two runs on the same files, one run for each gate. The more convenient automatic method reports the ratios in a single run, regardless of which gate(s) is active for the run. Usually, aggregation of cells is undesirable in flow cytometry, since the cytometer can make meaningful measurements only for single cells. Some antibodies induce unwanted aggregation of cells. The aggregates are seen on the scatter dot plot as events with scatter intensities higher than those for single cells. Although MFI can calculate the ratio of events in an "aggregate" scatter gate to those in a "single cell" scatter gate, such a ratio is not reliable since the mean number of cells per aggregate is not easily ascertained. A more reliable measure of aggregation is the loss in single cells per ml. However, most flow cytometers do not guarantee to take in a constant volume of sample per second. The intake rate may vary, especially when large aggregates tend to clog the intake or nozzle. Nevertheless, one may wish to use gate ratios to gage the approximate degree of aggregation. The sample data files illustrating such a case concern the indirect titration of an anti-Thy-1 antibody on a mouse T cell line, EL4. These data were obtained at UMass Amherst by Glenn Drabik. Although an entire series of dilutions was performed, only the control file (GATRAT01) and the highest antibody concentration (1/500, GATRAT02) are included to conserve disk space. In Windows Explorer, find the folder MFITUTOR\4AGGREG\NOBEADS containing the tutorial files GATRAT01, GATRAT02, and NOBEADS.CFG. If a file named MFI.CFG is present, it may be left over from a previous session and should be deleted. After deleting MFI.CFG (if present), copy the file NOBEADS.CFG to MFI.CFG. This ensures that you are starting with the configuration described in this tutorial. Now, start MFI. Examine the pre-configured run organization. Press 'G' to see the names of the two gates. Now, press Enter repeatedly until you see the tabular results for the first file. Note that 52% of the events are in the 'single' cell gate, and that the ratio of aggregates to 'single' cells is 0.16 (gate 2/gate 1). View the graphics screen. (The events to the left of gate 1 are dead cells.) No anti-Thy-1 antibody was present in this sample, so aggregation is minimal. Press Enter to see the tabular results for the second file. Here, a 1/500 dilution of anti-Thy-1 antibody induced considerable aggregation. Events in the 'single' cell gate have dropped to 27%, and the aggregate/'single' cell ratio has increased to 1.02. View the graphics, and notice the increased number of dots in Gate 2. Quit from MFI to DOS. We cannot estimate the percentage of cells in aggregates because we do not know the average cells/aggregate in gate 2. Since the cytometer is set to acquire a preset total number of events (in this case 10,000), and since the events/ml depend on the degree of aggregation, we cannot know the single cells per milliliter from such data. Nevertheless, a ratio such as (gate 2/gate 1) provides an index that increases as aggregation increases, and may be useful to help spot whether aggregation was a serious problem. The results for the entire titration are shown in the table at right. Median fluorescence intensities for the cells in the 'single' cell gate fit the one-site binding equation well, giving a concentration for half-saturation of 1/1,600. Thus, the antibody induces aggregation when well below half-saturation. A fixed density of standard beads may be used to monitor sample volume. Reading Howard Shapiro's 3rd edition of Practical Flow Cytometry, I learned that this method was patented by Becton-Dickinson in the 1970's, and also reported by C. C. Stewart and J. 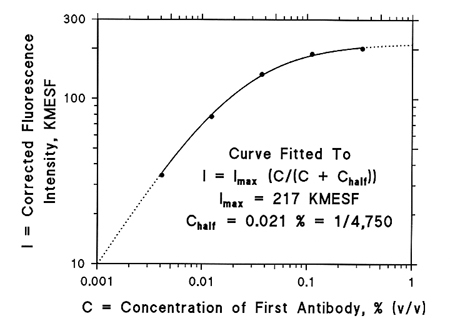 A. Steinkamp ("Quantitation of cell concentration using the flow cytometer", Cytometry 2:238-43, 1982). The ratio of single cells per bead is proportional to the single cells per milliliter. Thus, the percentage of cells in aggregates can be calculated from the reduction in single cells per bead, relative to a reference sample known to have no cell aggregation. This type of assay is termed a "single cell loss assay". We add 50 microliters of a suspension of Polysciences Fluoresbrite YG beads, 2 micrometers diameter, to each sample tube just before vortexing and analysis. (We typically use 1 bead per 2 cells. Our sample tubes typically contain 500 microliters before this addition.) When analysing living cells for aggregation status, the vortex shear applied immediately before flow cytometric analysis is controlled by using a multivortexing platform with a reproducible speed and time. Naturally, higher amounts of shear reduce the percentage of cells in aggregates, and this can be used to estimate the strength of adhesion. The sample data files included for this section, GATRAT03 and GATRAT04, were acquired by Dorie Barrera (UMass, Amherst) from living cells of a human B lymphocyte line transformed with Epstein-Barr virus (an "EBV LCL"). The line used is named JY. These cells aggregate spontaneously at room temperature by an LFA-1 and ICAM-1 dependent mechanism. Since LFA-1 function is absolutely dependent on Mg++, addition of the chelator EDTA abolishes aggregation, providing a control suspension of single cells. GATRAT03 contained EDTA, while GATRAT04 did not. In Windows Explorer, find folder MFITUTOR\4AGGREG\BEADS containing the tutorial listmode files GATRAT03, GATRAT04, and BEADS.CFG. If a file named MFI.CFG is present, it may be left over from a previous session and should be deleted. After deleting MFI.CFG (if present), copy the file BEADS.CFG to MFI.CFG. This makes sure you are starting with the configuration described in this tutorial. Now, start MFI. Examine the pre-configured run organization. Press 'G' to see the names of the gates. Now, press Enter repeatedly until you see the tabular results for the first file. For the moment, simply notice that (gate 1/gate 3) is 1.91; this is single cells/bead. View the graphics. Press 'M', then '4' to magnify the gating dot plot. In order to get both the beads and the cells on-scale, both FSC and SSC were log scales. A threshold on SSC worked best. The single beads are inside gate 3, but the dot cloud is so small it is obscured by the gate number. Press 'R', 'Enter', 'N' to turn off gate numbering so that you can see the single bead dots. Notice that there is a distinct cloud for 2-bead aggregates. 2-bead pairs ranged from 2.2% to 4% of the single beads in a 16-sample experiment. Turn gate numbering on again by pressing 'R', 'Enter', 'Y'. Single beads (gate 3) as a percentage of all events in gate 4 (all bead-events) ranged from 0.89 to 0.79 for the 16-file series. Thus, the degree of aggregation of beads was nearly constant and can be ignored. Press Enter repeatedly until you see the tabular output for the second file. Notice that single cells/bead (gate 1/gate 3) has fallen from 1.91 to 0.201, a change of nearly 10-fold. On the other hand, gate 2/gate 1 (all cell-events/single cells), similar to the qualitative index of aggregation used in the previous section for EL4, has increased only from 1.11 to 1.28. We surmise that the aggregates fell rapidly to the bottom of the tube and were not recorded, or were so large as to represent a small number of events. Clearly, single cells/bead is a much more sensitive measure of aggregation than is a gate ratio in the absence of beads. The percentage of cells in aggregates can be calculated from the single cells/bead ratios as 100(C-E)/C, where C is the ratio for the Control disaggregated in EDTA, and E is the ratio for the Experimental sample. This gives 100(1.91 - 0.20)/1.91 = 90%. MFI has many capabilities not covered in this tutorial. Especially popular is MFI's ability to put gated list mode data, or gated/smoothed histogram data, out into an ASCII file for use by generic spreadsheet or publication-quality plotting software. Explore the configuration menus to discover what will be useful to you. Now you are ready to try MFI with your own data files. When you run MFI with new data, it offers to print 'How to use MFI for the first time with your own data'. If you print this and follow it, it will guide you to the most effective use of MFI. The mode is the channel with the highest number of events. Although it is often near the center of a histogram peak, it is unreliable. It may not be quite in the center, or, if there is a pile-up of off-scale events, the mode may be in the first or last channel (not in the peak at all!). The mean (arithmetic) is the sum of the intensities divided by the number of events. Although the mean falls squarely in the center of a symmetrical peak, flow cytometry peaks are often asymmetrical. The mean is pulled quite off-center towards the tail of an asymmetrical peak, and hence is often an unreliable estimate of the center of a peak. The median channel is the one with an equal number of events to either side. This means that there is equal area under a histogram on each side of the median. Although the median does not fall at the highest point of an asymmetrical peak, it is the best objective estimate of the "center" of such a peak.